First, why do I do this and why am I here talking about it? Because massage works. It really works. It can improve your quality of life, improve your mental well-being, and uplift your emotions. But the how and why it works are somewhat mysterious. Now here’s the key: if massage works, then there must be mechanisms by which it works. And if we understand those mechanisms, then we can know which kinds of massage are most effective. That how and why, finding the “most effective” form of massage, is my life-long research project. I’m here today to talk about a couple styles of bodywork, “deep tissue massage” and “myofascial therapy” aka Rolfing. 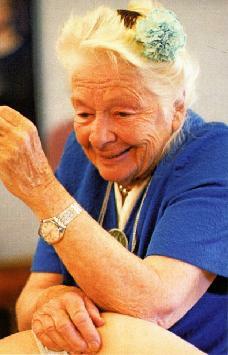 Rolfing is named after the founder of fascial therapy, Ida Rolf. She began her studies over 100 years ago, was one of the first women to get a PhD in biochemistry, and is, I think, the most influential pioneer in 20th-century bodywork. Later we can touch on a topic of especial interest to runners, namely the use of foam rollers. This stuff is all fascinating to me, but I’m not sure which parts will be of interest to you and I don’t want to bore you by “talking shop” for a half hour, so if our momentum slows, I’ll move on to another topic. I also have some video clips I can share, and can give a sample massage to anyone interested. Before we get into the advanced stuff, let’s start with something absolutely basic: what actually is massage? From the French word masser, meaning ‘to knead,” massage is usually defined as rubbing muscles with the hands to relieve tension or pain. But reality isn’t so simple. Lots of things done in a massage session aren’t rubbing or kneading, or don’t address muscles, or aren’t for relieving pain. Here are some examples. Moving the muscle and joint together, like A.R.T. Ontario’s Massage Therapy Act of 1991 defines the scope of practice of massage therapy as the assessment of the soft tissue of the body … the treatment of physical dysfunction and pain by manipulation … to improve physical function, or relieve pain. That’s a fine definition, but it omits one of the most common reasons people get massage: to relax, and because it feels good. So my definition of massage is simpler and broader: it is any contact on a body that achieves a physical, emotional, or neurological effect. It does this by altering proprioception, or our sense of self in space and gravity, which I’ll cover next. This is the key to everything, and also the least understood. Believe it or not, though humans have been massaging each other as long as we’ve had hands, scientists are only now beginning to understand how it works. Once we know how it works, then we’ll know which kinds of massage are most effective and which are just window-dressing. I’m not here to kill sacred cows, but many things taught in massage therapy schools, and some things your own RMTs might have said to you, are unproven or even false. I’ll jump to the punch line: How does it work? It’s all about the nervous system. Giving certain kinds of input to the nervous system can make the client feel different about her body, and her body feels different to her. We are changing “muscle memory.” Sensation changes, the mind changes, and emotions change. Those different techniques I demonstrated earlier are intended to affect different structures or tissue layers. Some techniques might claim to target tendons, or energy meridians, or our organs, or muscles, etc. But in the end, all we’re doing is touching skin. Every massage technique that exists, only touches skin. In massage school you learn to discriminate structures by palpation. You’re taught to feel the difference between a knot vs a trigger point, or between thickened skin vs a fascial adhesion. But in the end, this saying trumps all: “What you imagine is what you touch.” If the therapist has an intent to contact the subcutaneous fascia, he or she will believe that she is making contact with that layer. But in the end, they’re just touching skin. There’s a phrase for this: “palpatory pareidolia”. You know how when you look up at the clouds and pretend to see shapes of animals? Or when people see the face of Jesus in a piece of toast. That’s pareidolia, a word from ancient Greek which means “beyond the image.” It’s the same with the sense of touch: the therapist interprets what she feels in light of what she’s been taught to feel, is expecting to feel, or is looking for. And because massage is effective, we get a feedback loop of confirmation bias. I’ll give a real-life example. You go to your RMT with a knot in your shoulder. The therapist says “this is a knot which I’ll treat with trigger-point therapy.” She pushes down into the knot for a count of 10, repeats that 3 times, and success! The pain goes away. This success reinforces the therapists’ belief that trigger points are real and that her treatment fixed them. But another therapist might say something like, “that pain you feel is caused by a restricted range of motion, and the solution is stretching.” He stretches the affected muscle, the pain goes away, and everyone believes in that narrative. A third therapist might say “this muscle knot is caused by blocked chi.” She puts an acupuncture needle in the knot, the pain goes away, and everyone believes that acupuncture unblocked the energy meridian. But here’s the rub. All three of those therapists did something totally different: one applied deep static pressure, one stretched the muscle, and the third inserted a needle. And they all worked: the knot went away and the pain went away. Therefore, there’s something else going on, another common factor. Most researchers are now coming to believe that the common factor is the nervous system. It’s not about ligaments or fascia or chi — it’s about altering the body’s sense of self. We tend to think of pain as coming from the body. Pain is an input. I have an injury and it hurts. But as we rationally know, pain is actually an output. It comes from the brain, not the body. The inputs are stimuli like heat, pressure, movement. The outputs are the brain’s interpretations of these stimuli, e.g. pleasure vs pain. A classic example is a tickle. When I do this vs when my girlfriend does it, the sensation might be identical but my body’s response might be completely opposite. Another example is stretch. Stretching doesn’t mechanically lengthen body parts, as I’ll explain more fully below. Stretching changes the mind. Regular stretching causes changes in sensation, not changes in structure. This is called “stretch tolerance”: if you stretch a lot, you get used to it and you can handle the discomfort and push yourself more. Another example is when I’m pressing on a muscle knot and the client says the pressure is enough and it’s starting to hurt. If I know that I’m not really pressing hard, sometimes I might say “I’m going to let up a bit, take a slow deep breath and feel the tension let go.” In reality I might actually not reduce my pressure at all, but the client will say “that feels much better now,” and we both feel a decrease in resting tone. The knot goes away. Knowing this fact changes everything. I questioned every explanation, every technique, and every narrative that I learned in my massage schools, and discarded much of it. I could then re-integrate some of those techniques with a better understanding of why I was doing them. Not because things like fascial adhesions or energy blockages truly exist — but because the work is effective for altering the sense of self. The positive changes massage brings, like an increase in flexibility, is a top-down approach. It’s the brain, not the body, that allows a stretch to deepen, that allows a muscle to relax, or decides that a muscle knot doesn’t hurt any more. The type of bodywork that I find to be most effective in changing this sense of self is called myofascial release. Myo- is simply Greek for muscle. Fascia is a network of collagen fibers that covers and connects every structure in our body, from the largest muscles and organs to the smallest arteries, and even the membranes of each cell. It is like a plastic wrap that both separates everything in our body, and then holds in it place. Like fascia, tendons and ligaments are also made from collagen; all three are connective tissue. Ligaments join one bone to another, tendons join muscle to bone, and fascia connects muscles to other muscles and to the skin. Basically, fascia is a seamless, continuous web of protein fibers, from the surface of the skin down to our deepest layers, that glues the body together and integrates all its structures. Later, I’ll show some video clips of living fascia. Release is the sense of greater ease, of lightness and length, which certain kinds of bodywork can achieve. Therefore, Myo Fascial Release is a way of making the person feel light and tall, achieved by slowly lengthening muscles and all the structures that connect to them, from the deepest joints to the superficial skin. Interestingly, lengthening the fascia by external touch has the same effects as doing yoga. In yoga you stretch entire groups of muscles at a time, like when you lean forward to touch your toes. As you hold that pose for 30 seconds, you gradually lean farther forward as the tissues elongate. Therapists “do yoga” on just one muscle at a time, using their own hands to slowly apply the stretching force. This changes the “resting tone” of each muscle, which in turn lengthens muscles and tendons and makes you feel looser, lighter, longer. I’ll explain this more when we talk about foam rollers. Rolf herself was a member of one of the first yoga groups in New York City in the 1920s, and believed yoga to be one of the most effective forms of self-healing. When she began to learn manual therapy and osteopathy to heal others, her first solution was to help them get into yoga poses, using both her hands and posture re-education to guide their bodies into positions of freer movement. To the receiver’s nerve receptors, there’s not much difference between putting her own body into a position of stretch, vs a therapist using his hands to stretch her tissues. Because both can have the same effect, I think of Rolfing as “applied yoga.” I’ll explain this later when we talk about foam rolling and stretch reflexes. Most simply, myofascial is deep tissue applied with a line of tension. With DT, the emphasis is on manipulating the muscle itself, by pushing down on it, picking it up, or squeezing. Think of washing dishes and wringing out the kitchen sponge under the running water: the first few times you squeeze it, greasy dirty water comes out of the sponge. But after a few squeezes, the water runs clear. DT squeezes out the tension. Or more accurately, after being squeezed, a muscle’s resting tone is reduced. Myofascial involves holding a sustained tension on tissues, or making the tissues move in a certain direction. This gives a sense of “travel,” of things moving and changing. This is how it can alter posture, improve movement patterns, and release counter-productive holding patterns. It affects skin, muscle, multiple layers of fascia, and even the positioning of bones. It can feel intense, but not always deep. Little or no oil is used, so the skin is stretched along with underlying tissues. With MFR, the emphasis is on slow lengthening. I think of the process as meet, melt, move. First I meet the body: my hands rest gently on the skin and wait a few seconds for the nerve receptors to “adapt”, waiting until the touch doesn’t feel new and stimulating. Then I slowly sink in until I feel a sense of resistance in the tissues, as the outer layers melt. That can take another 10-20 seconds. Finally I move, slowly pushing or dragging the tissues into a lengthened position and holding it. This can take as long as 3 minutes. By contrast, DT is usually much faster. Regular massage is reactive: it’s for fixing complaints, or general maintenance. Rolfing is proactive, it’s for restructuring the body by changing the mind. Rolf used to say that we are not truly upright. We are only on our way to being upright. One of the jobs of a Rolfer is to speed that process along. I’ve long been fascinated by foam rolling, because it’s a case-study into “how does massage work”. Foam rolling is an example of differences between deep-tissue pressure and myofascial lengthening. First, if foam rolling works for you, then do it! If you feel better or looser after using it, that’s awesome, keep doing it, and don’t pay any attention to me the next few minutes. I’ll tell you the punch line up front: foam rolling has little to no mechanical effect on the body, but it can greatly relieve the sense of muscle soreness. There are three supposed benefits of rolling: increased flexibility and range of motion, improved performance, and reduction of Delayed Onset Muscle Soreness (DOMS) and pain. The main benefit people claim seems to be increased stretch, so let’s start with that. First, let’s talk about two kinds of automatic reflexes, “stretch” or “myotatic” reflex vs the “inverse myotatic” or “Golgi Tendon” reflex. One kind shortens a muscle, the other lengthens it. The classic example of a stretch reflex is when a doctor hits the quadriceps tendon insertion with his little rubber hammer. This causes a small but rapid shortening of the tendon. To prevent possible injury, the quads contract. There’s another and opposite reflex which responds to slow, sustained pressure like a yoga stretch. This activates receptors called Golgi Tendon Organs (GTO), which lowers the muscle’s “resting tone” and produces a lengthening response. This is the response evoked by MFR: a slow sustained stretch. To prevent possible injury caused by excessive loading, the hamstrings relax. Foam rolling can slightly trigger this reflex: a slow rolling pressure can induce a lowering of resting tone. But the effect on the ilio-tibial band (ITB) will be minimal, because (1) we’re not applying pressure where the GTO receptors are, and (2) we’re not affecting resting tone because the IT band has no muscle. The ITB is a thickening of the leg’s surrounding fascia latae, rather than a discrete entity. And it attaches to the femur along its entire length. In cross-section, the ITB is barely visible, and is seen as the surfacing of a deep inter muscular septum, rather than a discreet band on the side of the leg. That’s why there usually are no ITB bursae. Although the lateral line does indeed act like a tendon in contraction of the TFL and gluteus maximus, it is not a tendon. Its role is not simply to exert force on the knee joint like a pulley. In many ways it acts like a postural muscle to enable standing without muscular contraction, providing lateral stability, and has the important role of distributing shock from foot plant. When stress is applied to the lateral line it actually recoils like a spring to augment muscular contraction from above and increase spring in walking and jumping. Pressing vertically into the IT band is one drawback with the foam roller. We are trying to elongate and align tissue, not compress. Think of a tire rolling over the ground and leaving an imprint, vs “burning rubber” and leaving skid marks. One is gentle, but the other tears things up. We would need to press obliquely and then induce movement. A thought experiment shows that applying static pressure can’t change anything. Imagine you’re sitting on a hard chair for hours a time, like when you were a kid in school. You’re pressing over half of your body weight on the hip bones where the hamstrings attach. But when we stand up, there’s been no change. Our butts haven’t flattened, and our hamstrings haven’t lengthened. Foam rolling is painful, but once we understand that treatments like massage and rolling work via neurological communication instead of physically breaking down fascial adhesions, we can to apply these treatments more gently than forcefully. When we roll with hard, forceful pressure, this can increase the nervous system’s threat levels, which can be counterproductive. Gentler, milder work is often more successful at coaxing the nervous system to relax our tissues. To alter the IT band and eke out whatever stretch we can, you can either stretch it, or use MFR to slowly sink into whatever level you wish to free, then to grab without sliding and then apply force at an oblique angle while thinking alignment. Both deep-tissue massage and myofascial release can be very effective, and for some people — like myself — it’s the only kind of massage that feels good to receive. These two modalities can look and feel quite similar. The main thing that differentiates them is that DT focuses on pressure or squeezing individual muscles for local pain relief, while MFR lengthens whole structures for systemic postural change. Some practitioners believe that manual therapy can truly lengthen and repattern fascia. But collagen is a resilient material, literally stronger than steel — it has to be, given the huge tensions placed on tendons. It is unlikely that any real change could be effected in fascial structures without aggressive work, like the years-long stretching routines of a gymnast. Rather, most benefits of this (and any) massage are from neuro-muscular proprioception, which just means our body’s sense of itself. Pain sometimes has a physical cause in the muscle, like an old scar, but most tension has a different cause. It is set by the nervous system. The brain itself decides how short and tight, or how long and loose, each muscle is. When we do a daily stretching routine or a therapist is lengthening our myofascia, we might be lengthening the collagen a tiny amount, but mostly we’re retraining our brain to accept a longer length for that structure.